ASUS has announced a brand new Turing based model to their range with the ROG Matrix RTX 2080 Ti graphics card. The Matrix branding is synonymous with premium and the RTX 2080 Ti feature set looks nothing short of feature packed. What makes the ROG Matrix RTX 2080 Ti stand out from the crowd is the use of ASUS's new Infinity Loop cooling hybrid cooling solution. Infinity Loop integrates a closed loop cooling system within the cooling shroud housing a pump, radiator and tubing within a triple fan designed cooler. Due to constraints that are associated with cramming numerous components underneath what looks like a seemingly regular GPU cooler, the ROG Matrix RTX 2080 Ti takes up a total of three PCIe slots. ASUS claims the Infinity Loop cooling solution beats rival vendors with 120mm hybrid cooling designs and even competes with models that feature 240mm radiators. Included on the rear of the PCB is a metallic carbon fibre styled backplate with swathes of RGB LED lighting throughout the cooler which is supported by the ASUS AURA Sync software. The Infinity Loop cooler has three Axial-Tech fans and also features 0db technology. This means when the card is operating below 55 degrees Celsius, the Matrix cooler operates passively for optimal acoustic performance while light gaming and performing general tasks such as web browsing. 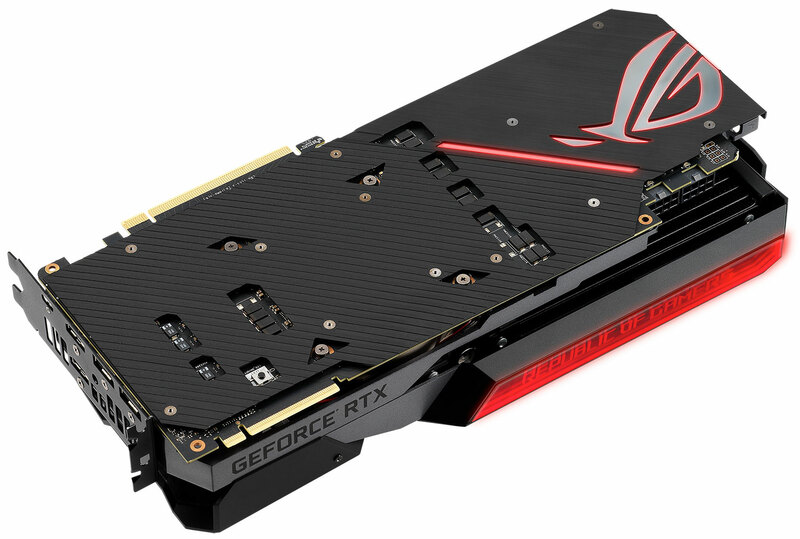 In line with a top of the range product, ASUS has stated that each ROG Strix RTX 2080 Ti PCB used goes through an aggressive binning process to ensure each Matrix card adheres to the high boost core clock speed of 1815 MHz out of the box. This is an 11% overclock over the standard RTX 2080 Ti Founders Edition which has a boost core clock of 1635 MHz out of the box. The GDDR6 memory of the ROG Matrix RTX 2080 Ti is also overclocked to 1850 MHz while the Founders Edition model has a memory clock of 1750 MHz. This makes the ROG Matrix one of the fastest out of the box RTX 2080 Ti models on the market. The rear panel of the ROG Matrix RTX 2080 Ti deviates from the standard RTX 2080 Ti Founders Edition slightly with two DisplayPort 1.4, two HDMI 2.0b and a USB Type-C VirtualLink video output. Power wise the Matrix RTX 2080 Ti uses two 8-pin PCIe power inputs and has a rated TDP of 300 W; 40 W more than the RTX 2080 Ti Founder Edition model which has a 260 W rating. 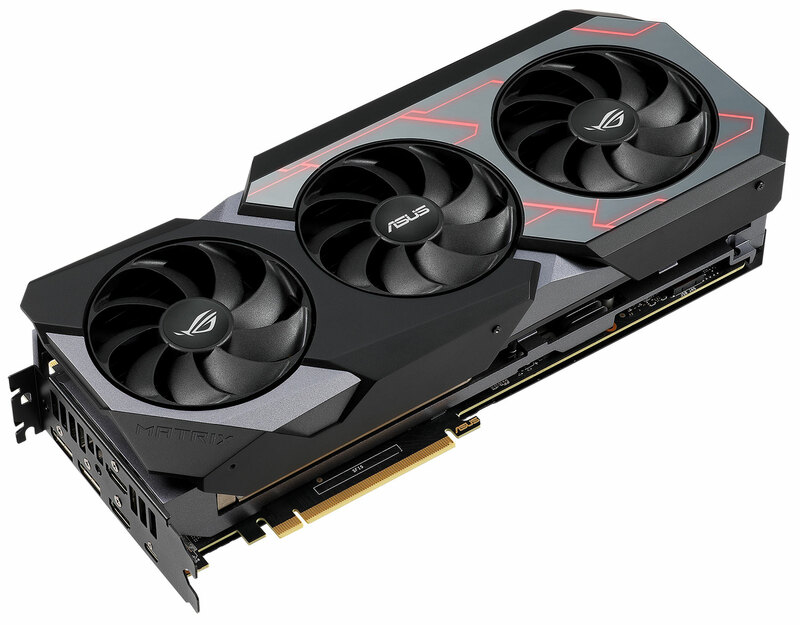 ASUS hasn't specified a price as of yet for the ROG Matrix RTX 2080 Ti but given utilization of the exclusive Infinity Loop cooling technology, it's not expected to be cheap. The ROG Matrix RTX 2080 Ti is set to make its entry into the market later this month.